Why do teachers and school leaders matter for equity? Research and experience show the powerful impact that teachers and school leaders have on student learning. But far too often, the students who most need the strongest teachers and leaders are the least likely to be assigned to them. Turning this pattern around is one of the most important things we can do to close gaps and raise achievement for all. States and districts1 must ensure that low-income students and students of color are not taught at disproportionate rates by ineffective, out-of-field, or inexperienced teachers, and must measure and report on progress toward eliminating inequities. 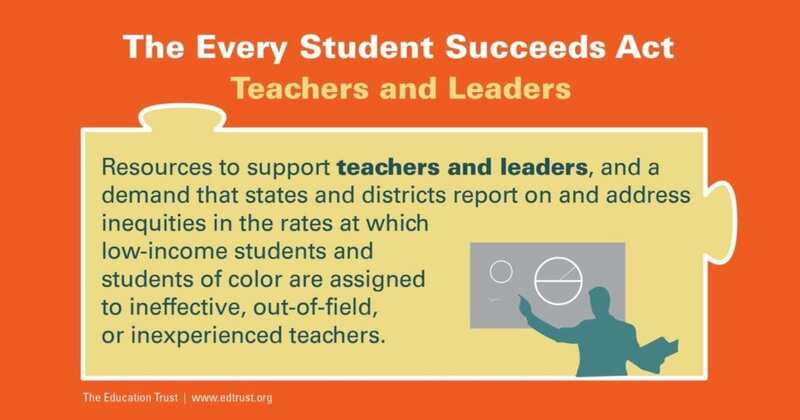 ESSA’s Title II program provides grants to states and districts that can be used on activities that improve access to strong teachers and leaders for low-income students and students of color. These funds can be used to, among other things, address inequities in access to effective teachers, provide professional development, improve teacher recruitment and retention, and develop and implement evaluation systems. If states choose to use federal dollars for development or implementing educator evaluation systems, these systems have to include measures of student achievement as one of multiple indicators. States and districts can also apply for additional competitive grant dollars for programs designed to improve teacher and school leader effectiveness, recruitment, and retention. How will states measure educator effectiveness? Will this measure allow your state to identify teachers who are particularly strong or particularly weak at improving student learning? How will states and districts live up to their responsibility to ensure equitable access to effective, experienced, in-field teachers? 1. When used on this page, the term “district” refers to both traditional public school districts and charters.